Anderson’s Lodge offers you a tremendous fly-in outpost experience on famous Lac Seul. Termed by many as the “Walleye Capital of the World”, this body of water is not only known for its superb Walleye fishing but also extends an invitation to some of the best Northern Pike and Muskie angling that you will find anywhere. Rated as on of the top 3 Walleye fisheries in the Province of Ontario, this lake has been a favorite of many anglers to the area for years. Wilderness Air Escapes Fly in to Vermillion Bay with Wilderness Air Escapes and see what Mother Nature has to offer! With excellent hunting and top class fishing, explore our offerings during the day before tucking in to one of our comfortable cabins at night. Or, establish your own tent camp — you can do it all with us! Big North Lodge - Visit our 2 trophy Waters outpost on Long Lake and Rogers Lake. Total privacy and be the master of your own wilderness domains. Very well equipped cabins with up to date boats and motors, not to mention the FANTASTIC walleye and northern pike fishing will bring you back again and again! This is our invitation to you to experience a truly fantastic Canadian fishing trip - whether you choose one of our all inclusive lodges, our housekeeping camp, or one of our fly in outpost locations, you will be sure to experience the fishing vacation that makes our guests return, year after year, generation after generation. We are proud of our family's commitment to the tourism industry. You can rest assured that our name is your guarantee. We believe that a successful fishing trip is a memorable one filled with great experiences and we endeavour to make your Canadian fishing trip the best that you can find anywhere. The Fahlgren family has been on Sydney Lake since 1933 and have been operating Sydney Lake Lodge since 1980. We are on exclusive waters and have some really good fishing with conservation fishing practices that go back decades. The walleye fishing is legendary, catch fish after fish, not knowing, if its that trophy walleye you have been waiting for. Enjoy Canada's Beauty The fascination of Wilderness: from the image of clear pristine lakes and the incredible serenity of remote fly-in camps comes the vision of mouth-watering fish sizzling over the fire. Whatever your wilderness image, Thunderhook Camps stand ready to assist you by providing the wilderness experience you've always envisioned. Thunderhook Fly-Ins is located 5 miles south of Armstrong, which is approximately 150 miles north of Thunder Bay, Ontario on Highway 527. Whether it’s hunting or fishing you’re looking for, come visit Northumbrian Resort and enjoy the best of northern Ontario. With fishing available at Minnitaki, Carling, Arc, Taper Lakes, Lac Seul as well as over 200 square kilometres of managed hunting grounds, you’ll be sure to enjoy yourself. Try to reel in walleye, northern pike and other species, or grab your bow or rifle and take part in a fall or spring bear hunt. Put your feet up in the evenings and relax in our modern, fully equipped cabins. With accommodations featuring up to five bedrooms a cabin, you’ll be able to bring the whole family! Canada's James Bay Lowlands consist of over 10,000 square miles of wilderness. The Cochrane District is renowned for over 400 lakes and rivers. You will fish for the mighty Northern Pike, the delicious Walleye, tricky Speckled Trout, tons of perch, wiley Whitefish and massive Sturgeon. Our lakes are teeming with hundreds of fish that only a fly-in can provide. Through careful management, conservation limits and rotating lakes, Air Cochrane CAS Ltd. is committed to providing you with a quality fishing vacation. North of Cochrane, amid a sprawling and unspoiled wilderness, lies incredible Kesagami Lake - Ontario's premier trophy northern pike lake. Shallow (averaging 7 feet), stained and rimmed with weedy bays, Kesagami is home to an inestimable number of pike over 40 inches (20 lb) and world-class fish measuring 50 inches (30 lb). Conservative size / possession regulations and a strong live-release awards program are in place, maintaining an exciting trophy fishery for the future. Additionally, Kesagami Lake offers exceptional walleye fishing where rocky shoals, islands and points always hold numbers of fish in the 1 to 4-pound class. Remote fly-in and remote drive-in boat-to outpost camps are also available for those of you wishing total privacy. All our remote camps offer one cabin per lake. All outpost camps are fully equipped housekeeping cabins. The remote settings allow for an abundance of wildlife viewing that can be appreciated by the experienced sportsperson and the novice alike. Our outpost camps offer Walleye, Northern Pike, Small Mouth Bass, Lake Trout and White fish. Camp Anjigami - If you really want adventure, and cherish the wilderness, we have something special for you! Five Outpost Camps - four of which are accessible only by float plane-offering excellent fishing. We encourage responsible conservation of the fishery resources. As a result, you will have an excellent chance of catching your choice of northerns, walleyes, speckled, or lake trout at any of our Outpost Camps and adjoining lakes. Tornado's Resortshas a Main Lodge located in Port Loring, Ontario, on Highway 522. From the Main Lodge, you can fly on our own float plane to Smoky Lake Lodge, or Portage Lake Lodge, both full-service outpost Lodges, or to Straight Lake Outpost or Bluepine Lake Outpost, wilderness retreats. Fly in to Muskoka Outpost Camps and experience northern fishing the way it was meant to be! Located in Muskoka, Ontario, you’ll enjoy fishing within the Severn River Conservation Reserve. 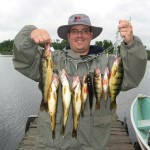 Hit the water during the day and reel in small and largemouth bass, perch and pickerel in one of our fleet of boats. Recharge in the evenings at one of our two camps, Boleau or Woodland. Both on individual lakes boasting well-furnished cabins, you’ll be able to relax in comfort. With a fully equipped kitchen and cell reception, you can still share your stories with those back home.